The Climate Group has posted an interesting story on its website and has been tweeting a key graph from the piece of work (below) with the attached text saying “From 2000 to 2012, wind and solar energy increased respectively 16-fold and 49-fold”. The story is headed “Wind and Solar Power is Catching up with Nuclear” and argues correctly that the global installed capacity of these two new sources of electricity are catching up with nuclear. Although the article concludes with the sobering reality that actual generation from wind and solar are still just a fraction of that from nuclear, the headline and certainly the tweets are somewhat misleading. 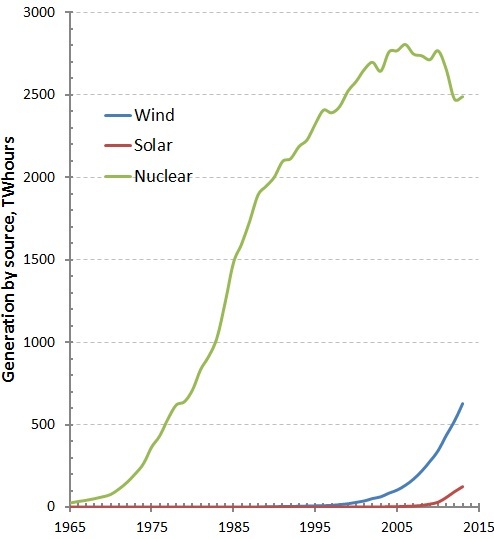 Wind, but particularly solar generation are still only a fraction of nuclear generation, even with the global nuclear turndown following Fukushima. 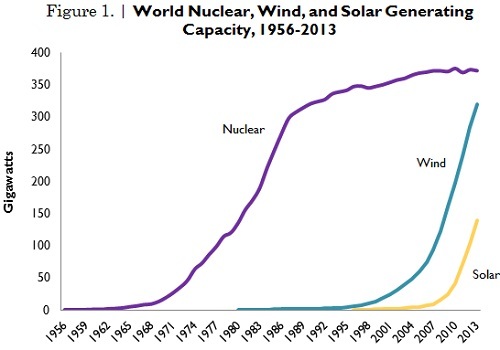 Interestingly, both wind and solar are only rising at about the same rate that nuclear did in the 1960s and 1970s, so we might expect another 30+ years before they reach the level that nuclear is at today, at least in terms of actual generation. The comparison of capacity rather than generation has become a staple of the renewable energy industry. Both coal and nuclear provide base load electricity and have very high on-stream factors. Depending on the national circumstances, natural gas may be base load and therefore also have a high on-stream factor, but in the USA it has been closer to 50% as it is quite often used intermittently to match the variability of renewables and the peaks in demand from customers (e.g. early evenings when people come home from work and cook dinner). This is because of the ease with which natural gas generation can be dispatched into or removed from the grid. However, natural gas is also becoming baseload in some parts of the USA given the price of gas and the closure of older coal plants. Capacity comparisons look great in that they can make it appear that vast amounts of renewable energy is entering the energy mix when in fact that is not the case, at least not to the extent implied. Renewable energy will undoubtedly have its day, but like nuclear and even fossil fuels before it, a generation or two will likely have to pass before we can note its significant impact and possibly even its eventual dominance in the power sector. Still no sign of the rational middle? Agree … Shame on The Climate Group management for not vetting the work of an obviously non-technical apprentice. Really! Comparing wind and solar to nuclear is also irrelevant! A meaningful comparison would chart the trajectory toward total carbon-fired power plant output. If THAT graph validates your multi-generation “catch up” period, then we have something to work with. If THAT trajectory points to a 4°C, 5°C, 6°C or 8°C future, we know what we have to do! That’s electricity … now let’s do the same for liquid hydrocarbon fuels. Do you have the data to take a crack at that? Give it a look see. I challenge you to tell us we don’t need to schedule the retirement of 750 refineries over the next two decades. Given that you say the story’s argument is correct AND that “the article concludes with the sobering reality that actual generation from wind and solar are still just a fraction of that from nuclear”, your statement about the headline and tweets being misleading is a personal statement which doesn’t follow any syllogism rule. You would be hard pressed to find an article today which has a headline lengthy enough to ensure it precisely reflects the article’s conclusion – and expect anyone to read it. 50% of australia’s coal exports in 2009 were coking (metalurgical) coal. The only affordable alternative for coking coal is charcoal from certified logged forests. China has a huge growing demand for steel. So the task is to find certified forests to meet that demand, I doubt that is feasable without coal for the next twenty years.